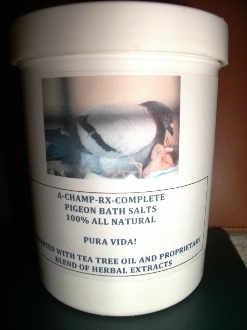 A-CHAMP ALL NATURAL CONCENTRADED PIGEON BATH POWDER ENHANCED WITH HERBS AND HERBAL EXTRACTS!! !CONTAINS: TEA TREE OIL, AND EUCALYTUS, AND A PROPRIETARY BLEND OF ANTIBACTERIALS, ANTIVIRALS, AND SKIN CONDITIONER! !